Dana Tomlinson and the South Bay Union School District Education Foundation are Dig Imperial Beach's "Unsung Heroes". At many of our events in Imperial Beach you will see a table set up similar to the one to the left at the Feed the Kids and Family Event held at the Boys and Girls Club this last Thanksgiving. This has been made possible by two different non-profit groups. The first I am mentioning is the South Bay Union School district Education Foundation that is the beneficiary of the San Diego Book Project (SDUSDEF). 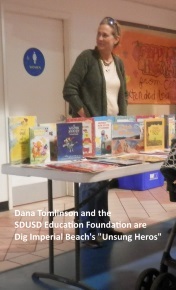 The SDUSDEF has been giving out children s books at all sorts of events around Imperial Beach for many years now. These book have been available to them because of the work done by the San Diego Book Project which is located in the East Village of San Diego and is the child of Founders Mark and Terry Meaney. Not oly is the SDUSDEF passing these books out to children, so are the Imperial Beach South Bay Kiwanis at some of their events and I wouldn't be surprise is other local organizations are doing the same. and she is often picking up books for these other organizations like the Kiwanis I mentioned. The SDUSDEF is in danger of closing down if they don't get more involvement from adults in their organization. Right now everyone of the 9 spots they have available on their board is filled by a teacher or someone in the educational field. Per Dana, if they don't get more involvement by parents, they will be shutting down at the end of the year. The South Bay Union School district Education Foundation do so much to help our children in Imperial Beach. Not only are they constantly passing out children's book whenever they can but they also fund many of the extra project in the elementary schools that children would otherwise not have. The South Bay Union School District Education Foundation is a non-profit organization that supports students of SBUSD. In the past, the Foundation has awarded over $50,000 in mini-grants to teachers across the district for programs and projects to enhance learning. 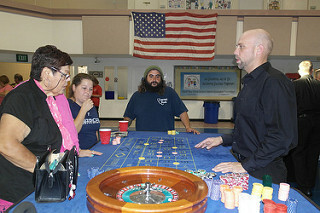 Last Fall they held Casino Night to raise funds for these programs. on Friday, October 9, 2015 at the Imperial Beach Boys and Girls Club from 4:30 to 8:30pm. Throughout the evening, participants had great fun playing games such as blackjack, poker, craps and roulette, as well as enjoying the wonderful refreshments provided by Major Events. Numerous individuals and businesses donated fantastic raffle prizes. Gamers’ winnings were converted to raffle tickets and numbers were called throughout the evening. A special raffle was held for 4 parkhopper tickets to Disneyland/California Adventure. By all accounts, everyone attending had a marvelous time! For pictures, please see https://www.flickr.com/photos/101317853@N05/albums/72157659731720135 . Anyone interested in helping out with the Education Foundation’s events, please contact sbusdef@yahoo.com or call Dana Tomlinson, 619-997-0658. The Foundation’s mission is to solicit, manage, and disburse voluntary contributions to provide financial support for educational and enrichment programs for the students in the communities served by the South Bay Union School District. It is an all volunteer organization and it welcomes all who are interested in the same goals. Their next Board of Directors Meeting is January 19, 2016 at 4:30 pm – 5:30 pm at the SBUSD Education Center. Because they do so much for the children of our community and because they is such little awareness of what they do, Dana Tomlinson and the SBUSD EDUCATION FOUNDATION are the Dig Imperial Beach 2015 "Unsung Heroes"
A big "Thank you" to Dana and the Foundation for all they do to help our children!